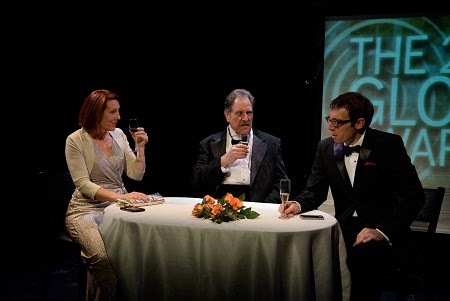 Carol Schultz (seated) with Micah Stock standing behind her, Dominic Cuskern, Rachel Botchan, and Sean McNall in a scene from Terrence McNally’s “And Away We Go” at the Pearl Theatre through December 15th. Photos by Al Foote III. Theater has evolved over the centuries. Greek tragedies and comedies had state sponsorship, and free admission for all. Time moves on, and the theater continues to serve different audiences in different times. State assistance can also bring censorship, of course. With privatization come the headaches of raising funds to keep the shows going. Micah Stock and Sean McNall. Photo by Al Foote III. 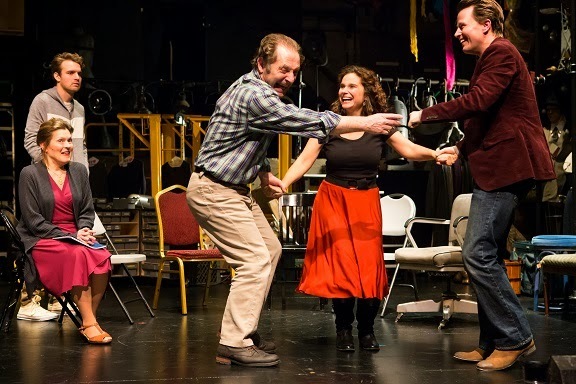 Meant as a love poem to theater and its folk, Terrence McNally’s “And Away We Go,” at the Pearl Theatre Company through December 15th, mashes the traditions and tribulations of actors, acting and acting companies into a historical pastiche. As it goes traipsing across the vast panoply of theater history, “And Away We Go,” ambles through the Greek festivals, over to Richard Burbage’s English stage, to the French and Russian revolutions and the playwrights who embodied them, to the impecunious present with a brief stop for Bert Lahr’s “Waiting for Godot” in Coconut Grove in 1956. “And Away We Go” succeeds at being sometimes funny, sometimes maudlin, occasionally insightful, sometimes dreary, with the French (Versailles 1789) and Russian (Moscow Art Theatre 1896) sequences gratuitous and poorly executed. Many theatrical styles and periods are overlooked, others are overbooked. The Greeks practiced a long form that has continually been whittled down so that McNally and his contemporaries tend towards the shorter play. “And Away We Go” attempts to find its perspective and cover the full range of theatrical history in under two intermission-less hours. By the way, I learned that it was the French who brought us the interval. In Shakespeare’s time, the audience came and went as the actors performed. Given the breadth of this survey, it would appear that McNally isn’t aware that you can’t do it all in one evening. 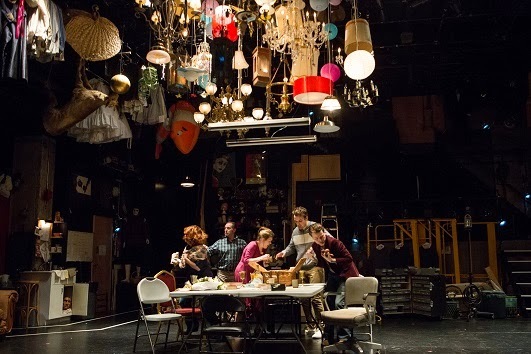 Sandra Goldmark has created a scenic design that makes the stage look like a gigantic prop room. It’s also a busy day at the office for the Pearl’s troupe, all of whom are more than willing to tackle McNally’s short but expansive text. Sean McNall and Dominic Cuskern, both Pearl Company regulars, distinguished themselves well. Both Carol Schultz and Rachel Botchan, also long time Company members, gave fine performances, with Ms. Schultz doing a particularly nice turn as Shirley Channing, executive director of a resident theatre company. Donna Lynne Champlin, a Broadway and off-Broadway vet making her first Pearl appearance, was very very good in all her many roles. Micah Stock, another guest at the Pearl, had some difficulty with his French playwright, Christophe Durant, but was very good as Pallas, a member of the Greek chorus, and Kenny Tobias of the Coconut Grove concession stand. For more information about “And Away We Go,” and the Pearl Theatre Company, please visit the Pearl website. What would you do if you discovered that you were an heir to a distinguished family? One that had denied your existence and birthright and driven you and your mother into poverty? The answer in “A Gentleman’s Guide to Love and Murder,” at the Walter Kerr Theatre in an open run, is to have our disinherited hero kill his way to the top. 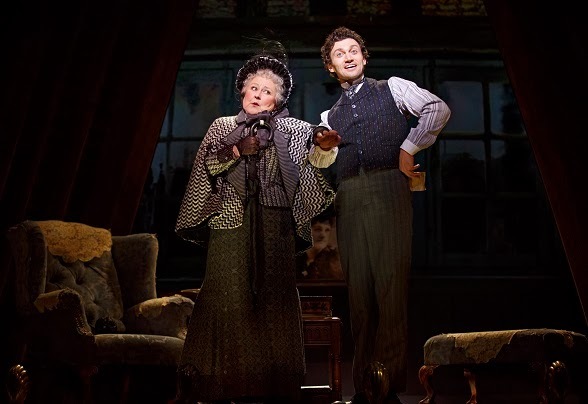 Jane Carr as Miss Shingle and Bryce Pinkham as Monty Navarro in a scene from “A Gentleman’s Guide to Love and Murder” at the Walter Kerr Theater. “You’re a D’Ysquith,” Miss Shingle informs Monty. Photo credit: Joan Marcus. In a world in which motives for murder are so often random, it’s refreshing to see how carefully planned Monty Navarro’s (Bryce Pinkham) ascension is. All the mayhem he bestows is sweetly done, but Monty finds he has a knack for it. Here’s a young man who finds purpose and a new skill. 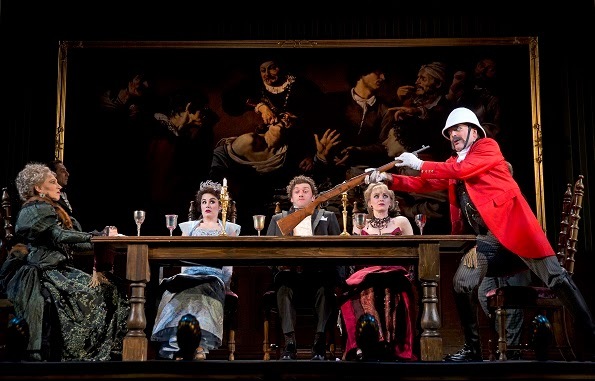 Joanna Glushak as Lady Eugenia, Lauren Worsham as Phoebe D’Ysquith, Bryce Pinkham as Monty Navarro, Lisa O’Hare as Sibella Hallward, and Jefferson Mays as Lord Adalbert D’Ysquith, “Looking down the barrel of a gun” from “A Gentleman’s Guide to Love and Murder” at the Walter Kerr Theater. Photo credit: Joan Marcus. “A Gentleman’s Guide..” has a book (and lyrics) by Robert L. Freedman, based like the Alec Guiness film,“Kind Hearts and Coronets” on Roy Horniman’s Israel Rank: The Autobiography of a Criminal. The music, and additional lyrics, by Steven Lutvak, that accompanies all this silliness is superbly light and airy. The lyrics match the froth of the score inserting clever plot points to move the story along. The relatives Monty is despatching, improvising as he goes, (all played by Jefferson Mays) are a varied lot of upper crust fops, toffs, fools, and snobs. at the Walter Kerr Theater. Photo credit: Joan Marcus. Bryce Pinkham is an amiably baby-faced murderer. He sticks to the spirit of the script executing his killing spree with a wink and an air of surprise. Jefferson Mays, in turn, is all bluster as one high-toned relative, gently ridiculous as another, always clearily enjoying himself. The cast led by Pinkham and Mays are as bright as a new penny. There are three other stand-outs in this fine ensemble. Lisa O’Hare as Monty’s love-interest Sibella Hallward is fetchingly coquettish, while Lauren Worsham as Monty’s cousin Phoebe D’Ysquith is beautifully eccentric. Both women have wonderful voices, and excellent comic delivery. The third is Joanna Glushak who grandly steps out of the chorus as Lady Eugenia, Adalbert D’Ysquith’s dyspeptic spouse. Deftly directed by Darko Tresnjak, the British import is as pleasanly insubstantial. The sets, by Alexander Dodge, feature a puppet stage inset on which mostly the indoor scenes are played; like the book, music and lyrics, the set is cleverly done and there are effects that amuse. 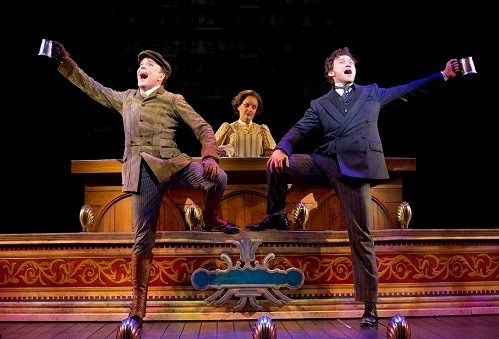 Despite all the wit and talent in “A Gentleman’s Guide..,” the play is a trifle, a fluffy, flimsy and enjoyable romp. Do you ever wonder whywe find murder, while we decry the crime, such satisfying entertainment. In “A Gentleman’s Guide to Love and Murder,” it is the pleasure of watching the underdog get even and get away with it. “A Gentleman’s Guide…” is pure escapism, a beach read for a winter’s eve. 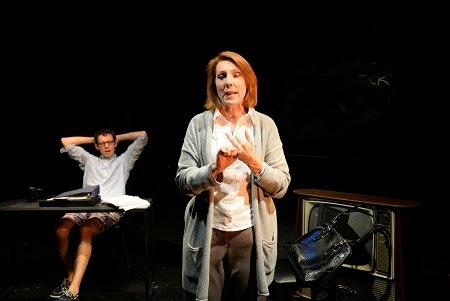 Enjoy the spirit of Thanksgiving with the 99% when Around the Block presents its second installment of Recovery Blip Or Double Dip?-– short plays on the everyday struggles of the 99%. In 2004 Around The Block / Al Doblar La Esquina won an OBIE citation for being one of the producing companies for The Imagine Festival, focused on urban poverty and economic survival. The reprise of the festival features six one-act plays by Marcia Slatkin, Nina Howes, Carlos Jerome, Edgar Chisholm, William Marley and Allan Yashin. The off-beat Thanksgiving event will run from November 27th through December 1st at the Dorothy Strelsin Theatre, 312 West 36th Street (1st floor). For tickets and information, call 1-800-838-3006 or visit http://www.brownpapertickets.com/event/510663. On December 19th, 20th, and 21st at 7pm at St. John’s Lutheran Church, 81 Christopher Street, Peter Filichia’s “Adam’s Gift” riffs on Charles Dickens’ “A Christmas Carol.” Tickets are FREE. 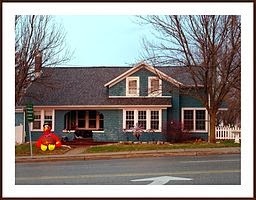 but you must have a reservation and please make a suggested donation to St. John’s at the door. Reserve your tickets at, info@adamsgiftstheshow.com. Traditions are a big part of the holidays, so join Urban Stages in their fifth season of A Twelve Night Musical Celebration including Musical Theatre, Cabaret, Jazz and more to benefit Arts and Education. Winter Rhythms 2013 will include a Centennial Celebration of Mary Martin, Sinatra at the Movies, and A Salute to Singers/Songwriters of the 70s. Look for performances from the likes of Karen Akers, Leslie Uggams, Lynn Cohen, T. Oliver Reid, among many others at Urban Stages Theater from December 3-15, 2013. Tickets may be purchased by visiting www.SmartTix.com or calling 212 868-4444 for all performances. For a full schedule and more information, please go to www.urbanstages.org. Brothers Grimm on a German stamp, 1959. Another holiday tradition is the Axis Theatre’s Annual Family Holiday Show, in its 12th year, “Seven in One Blow, or the Brave Little Kid.” Adapted from a Brothers Grimm fairy tale by Randy Sharp, who also composed the music and directs the show, “Seven in One Blow” plays from December 6-22, with proceeds from the December 14th performance going to St. Jude Children’s Research Hospital. For more information, go to www.AxisCompany.org or call 212.352.3101. The Wild Project has its own spirit of celebration for the holidays. These are shows strictly not for your youngsters. The original musical parody of Mad Men, “The Mad World of Miss Hathaway” features unlimited amounts of booze, broads and bawdy good times. Its return run is from Friday December 13th though Sunday December 16th. 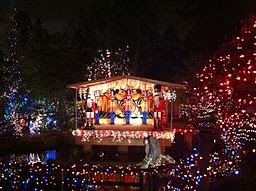 From the 19th through the 22nd, “Nicholas Gorham’s White Hot Christmas,” invites you to learn the true spirit of Christmas, which for this Hollywood star is money and glamour. Check out the full schedule of holiday treats from The Wild Project at www.thewildproject.com or by calling 212.352.3101. Did Jack Ruby Act Alone? Real life mysteries, like the assasination of JFK, have an endless fascination. Keeping evidence sealed on the grounds that it is of importance to our national security practically invites conspiracy theories. The Warren Commission left so many questions unanswered that it was bound to leave suspicions hanging. This is the starting point for “Witnessed By The World,” at 59E59 Theaters through December 15th. Joan Ross (Charlotte Maier) is a dogged reporter holding on to a particularly tough bone; Joan is sure that the mob killed both Kennedy brothers 50 years ago. As it happens, Joan lucks into a film that Ira Basil (Max Gordon Moore) is writing, “The Untitled Mafia Project.” Luck, of course, is a relative term, but she steers Ira towards the mob and Jack Ruby angle for his movie. As Ira envisions it, the film will end before the incidents in Dallas 1963, with a picture of how Jack got involved in mob activities. Jack Ruby, born Jacob Rubenstein and one of eight children growing up in poverty, loved the high life. Joan tracks down his only living sister, Eileen Kaminsky (Lois Markle) to help her with the background. In the process, she uncovers the key to the JFK-Mafia link that she so tenanciouly wants to pursue. Why did Jack Ruby kill Lee Harvey Oswald? Was it a cover-up? What don’t we know about the Kennedy assassinations? With such potentially explosive material, it’s a shame that “Witnessed by the World” doesn’t shimmer and scintilate. Certainly for the most part, it’s engaging, but there are moments when interest flags. Joan’s intensity can be off-putting, in fact, is probably meant to be off-putting, but there is a predictablilty to “Witnessed by the World” hwich lets it wind down and disappoint. Rounding out the characters thag inhabit and inform “Witnessed by the World” are Joan’s former boyfriend and current poker buddy, Aaron Spencer (Bob Ari) and his pal Joe Cappano (Joe Tapper.) Joey, to Joan’s delight, would like to introduce her to “Uncle Tony,” a mobster who knew Jack Ruby back in the day. For a schedule, tickets and more information about “Witnessed by the World,” please visit 59e59.org. in Richard Abrons’ “Every Day A Visitor.” Photo by Ronald L. Glassman. Living to a ripe old age, as the somewhat unfortunate expression goes, has its drawbacks. 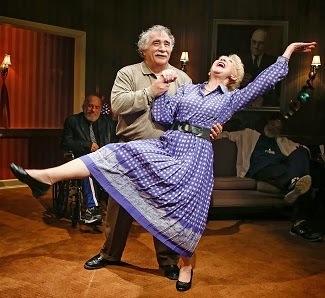 In Richard Abrons’ new comedy, “Every Day A Visitor,” at The Clurman in Theatre Row through December 14th, those disadvantages include bickering, monotony, and a diet too dependent on lentils and cabbage. Bob (Raphael Nash Thompson,) the orderly who oversees an old-age home in the Bronx, inspired by Figliozzo’s (Teddy Coluca) deciding to “be” Fiorello LaGuardia, finds a way to liberate those in his care. Play acting at politics is part of his scheme. 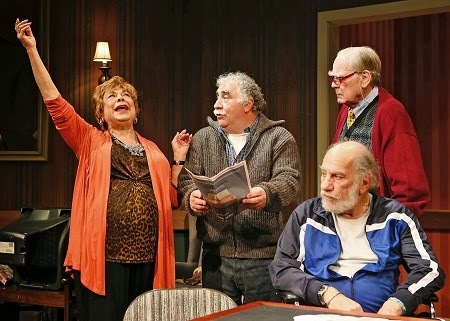 Henry Packer as Davidowitz, George Morfogen as Stoopak, Teddy Coluca as Figliozzo, Joan Porter as Mrs. Levy, Raphael Nash Thompson as Bob and Janet Sarno as Mrs. Marcus at a home for the aged in the Bronx in Richard Abrons’ “Every Day A Visitor,” at Theatre Row’s Clurman Theatre through December 14th. Photo by Ronald L. Glassman. Bob appoints the melancholy Stoopak (George Morfogen) president in an effort to bring him closer to the other residents. 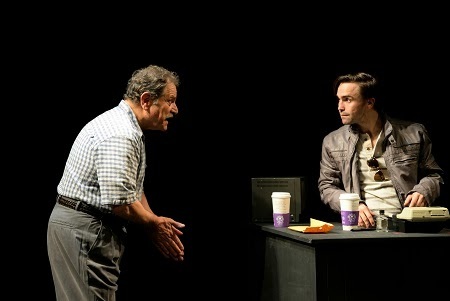 Tilly Marcus (Janet Sarno), always game to play at anything, dons a hat and becomes Bella Abzug while Albert Grossman (Evan Thompson) eagerly takes on the persona of Alan Greenspan. Even Feltenstein (Bern Cohen), the curmudgeon in residence, enjoys being Henry Kissinger. home for the aging is no longer dull. Stoopak’s laws include “Joy” and that no one of them should die alone. “Every day a visitor,” he decrees so that each of them would have company during a hospital stay. For more information about “Every Day A Visitor,” visit them at Telecharge. 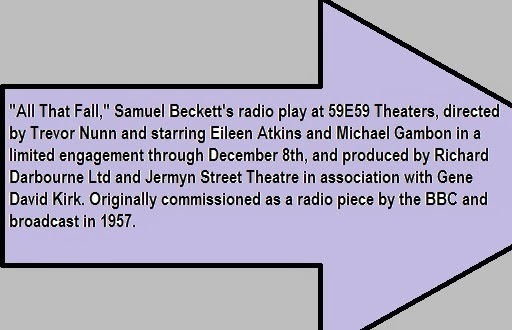 "All That Fall," Samuel Beckett’s Radio Play: A funny thing happened on the way to the train station…. Weavving the extraordinary from the everyday is the poet’s privilege and gift. 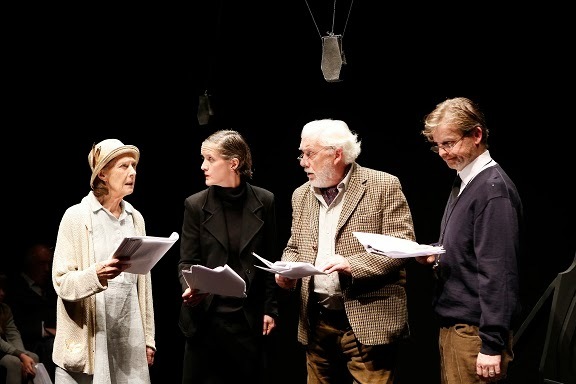 In Samuel Beckett’s “All That Fall, A Radio Play,” at 59E59 Theaters through December 8th under the direction of Trevor Nunn, the ordinary characters of an Irish country town are out and about on a fine morning. at 59E59 Theaters. Photo by Carol Rosegg. The aged Mrs. Rooney (Eileen Atkins) is on her way to the railroad station to meet her husband’s train. Along the way, she complains and berates her neighbors as she goes. Mrs. Rooney next encounters Mr. Tyler (Frank Grimes) on his bicycle, and Mr. Slocum (Trevor Cooper) offers her a lift in his automobile, and is tasked with hiking her up into the car. But Mrs Rooney’s crispest exchanges are with the stationmaster, Mr. Barrell (James Hayes), and the pious spinster, Miss Fitt (Catherine Cusack.) When Dan Rooney (Michael Gambon) finally comes off the train, led by the boy Jerry (Liam Thrift) he is all misery and bluster. 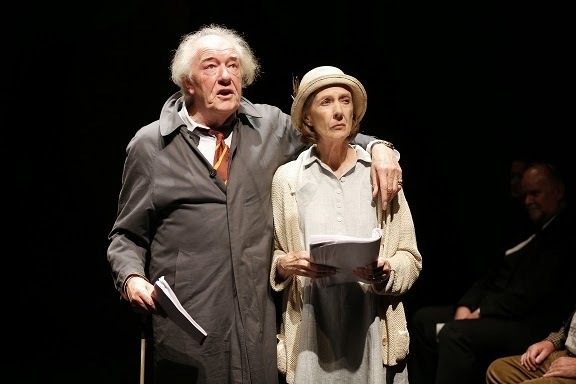 Michael Gambon as Dan Rooney and Eileen Atkins as Mrs. Rooney in “All That Fall,” under the direction of Trevor Nunn at 59E59 Theaters through December 8th. Photo by Carol Rosegg. 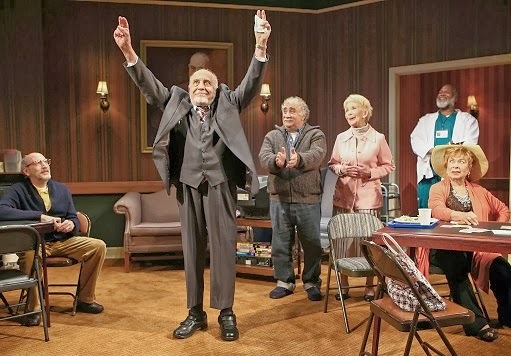 Staged as a radio play, with sound effects (with Paul Groothuis leading the sound design), and old -style microphones dangling from the ceiling across the nearly bare set (designed by Cherry Truluck), “All That Fall” is read from textts in the actors’ hands. As gthe fine morning wears away, “All That Fall” is soggy and depressing. For more information about “All That Fall,” please visit 59e59.org. 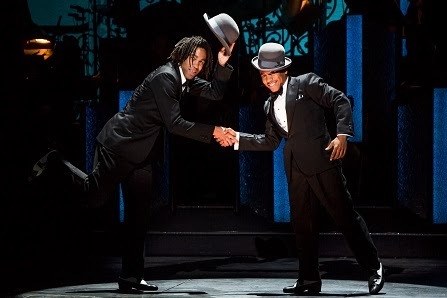 A Harlem Renaissance at "After Midnight"
“After Midnight,” which started life as “Cotton Club Parade” in two seasons of the City Center Encores! series, can be found in good company. The long-running “Chicago,” originated at Encores!, which generally revives shows that were short-lived in their first Broadway incarnation. An Encores! production generally mimics a late-phase workshop, with minimal scenery, few costumes, actors singing from books. It also always features a first-rate orchestra. 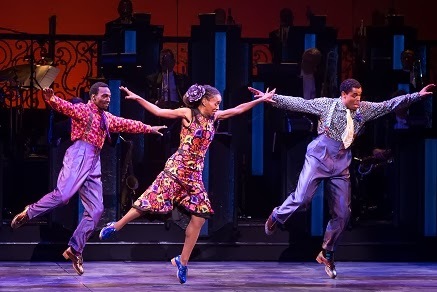 Daniel J. Watts, Dormeshia Sumbry-Edwards and Phillip Attmore in a tap number from “After Midnight.” Photo by Matthew Murphy. A few Encores! 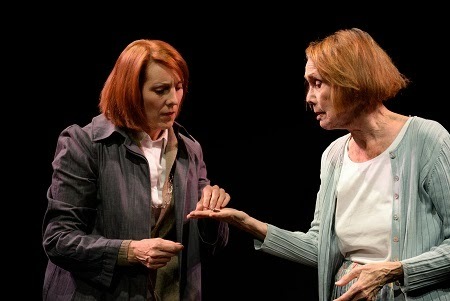 transfer to Broadway runs, like the recent “Finian’s Rainbow” and “Chicago.” Most don’t enjoy the longevity or the long-leggedness of the latter. “After Midnight,” at the Brooks Atkinson Theatre for an open run, was conceived by Jack Viertal as a tribute to the jazz palaces and night clubs of Harlem. It is a grand spectacle, with resplendent costumes by Isabel Toledo that are also a tribute to the era of big night clubs. 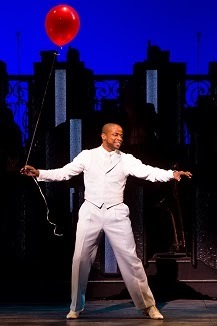 Dulé Hill has the world on a string, in “After Midnight.” Photo by Matthew Murphy. 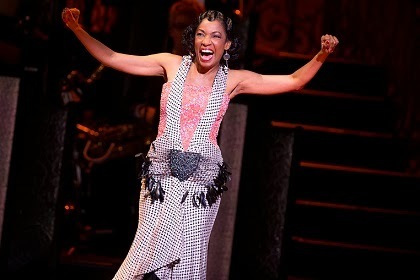 Tony-winner (for Doubt) Adriane Lenox is a lusty lady in “After Midnight.” Photo by Matthew Murphy. 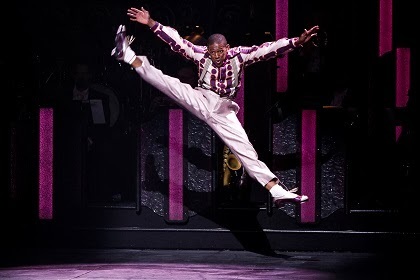 All the dancing is “oh” inspiring, and the snaky moves of “iGlide,” (Julius Chisholm) are especially fascinating; here is a man whose moves are so supple, he seems to have no bones. 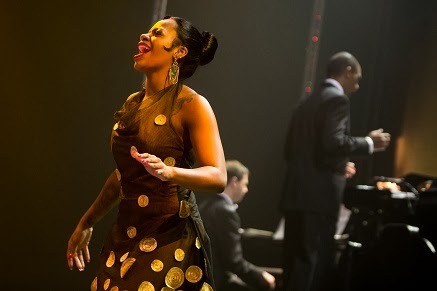 Fantasia Barrino, backed by The Jazz at Lincoln Center All Stars (Adam Birnbaum on piano and conductor Daryl Watts, pictured) singing Dorothy Fields & Jimmy McHugh’s “On The Sunny Side of the Street” in “After Midnight” Photo by Matthew Murphy. The Cotton Club had “Celebrity Nights,” and “After Midnight” aims to follow suit, with Fantasia as the Guest Star for now, and k.d. lang, Toni Braxton and Kenny “Babyface” Edmonds slated for future appearances. Don’t look for a story from “After Midnight,” except for the vignettes in song that it delivers. This is strictly a night out watching a romanticized memory of the by gone night spots that once graced Harlem. For more information about “After Midnight,” visit www.aftermidnightbroadway.com.